Built-in burners simply create an atmosphere in your garden! With a comfortable built-in burner, your garden table or lounge table can be fitted with a luxurious gas fireplace. Built-in burners are available in different sizes and from different suppliers. Our range includes the Happy Cocooning built-in burner and the Cosi fires built-in burner. Both the square model and the built-in burner rectangle are easy to order online at Firepitonline.com. And do not forget about the handy accessories! Are you looking for a quality burner or built-in fireplace? Then you are at the right place at Firepit-online.com. Within our huge range of fire tables you will also find a number of comfortable built-in burners. With a separate built-in burner, you can easily create a special fire table from your "ordinary" garden table. Built-in burners are gas heats that you can lower into a recess of a garden table. When purchasing a built-in burner, you will find a template that allows you to put the dimensions of the bin on the table. If you are a little handy and have a faucet saw, you can turn your garden table into a cozy fire table. All you have to do is connect the built-in burner to a gas bottle and enjoy a cozy fire. Separate built-in burners feature a stainless steel burner that is easy to operate with the clear control panel that disappears underneath the table. The burner is camouflaged by the supplied logs and lava rocks, which makes the fire look like a real wood-fired flame game. Eventually, the built-in burner gives you a nice lounge fire without smoke or sparks. And that's nice at the table! After use, cover the burner with the enclosed lid. Separate built-in burners are available in two different shapes: square and rectangle. 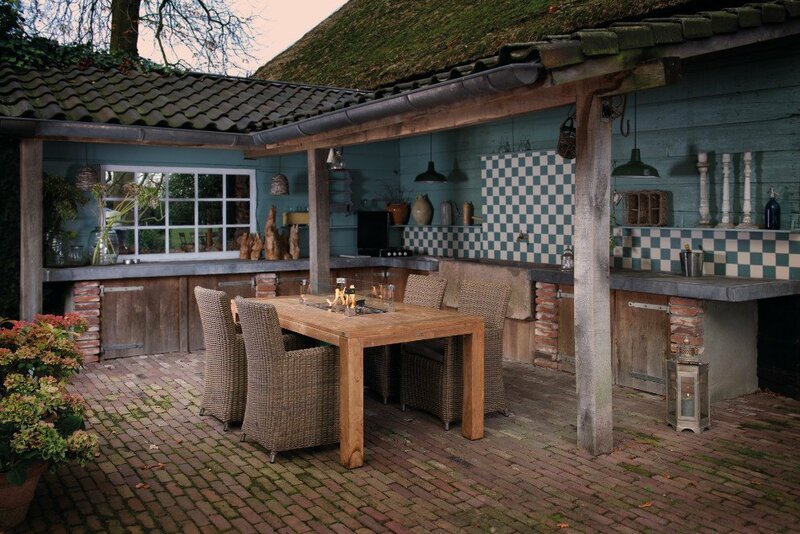 You can therefore perfectly match the shape to your garden table shape. Generally, a square fitting burner fits more with a square table than a rectangle. At Firepit-online.com we have Happy Cocooning and Cosi Fires built-in burners. All gas burners are in stock, so order the built-in burner online before 17.00h, and your order will be shipped still the same day. Do you have any questions? Our employees will be ready to answer all your questions!